I hope you guys have had a brilliant Christmas and sent off the New Year in style. Last year I was off to a party for New Years Eve but this year my plans are absolutely zilch so a family night in with trivial pursuit was definitely on the cards! Plus I worked 9am-5.30pm today so an early night was needed (this did not happen). 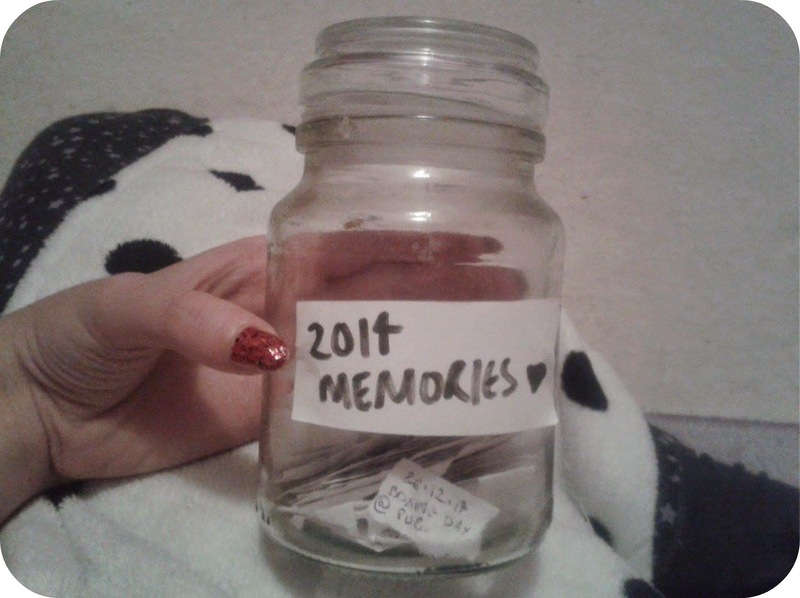 This time last year, I decided that I wanted to put together a memories jar, so I would be able to look back and reflect fondly on the things that I'd gotten up to in the year. I managed to consistently keep up with all the good times in my life and omit the bad ones, and today I can finally crack open the jar and read back over the high points of 2014, to start off a positive 2015! So, I have collated all these bits of paper into months and thought I'd do little summaries per month. I hope you guys enjoy! 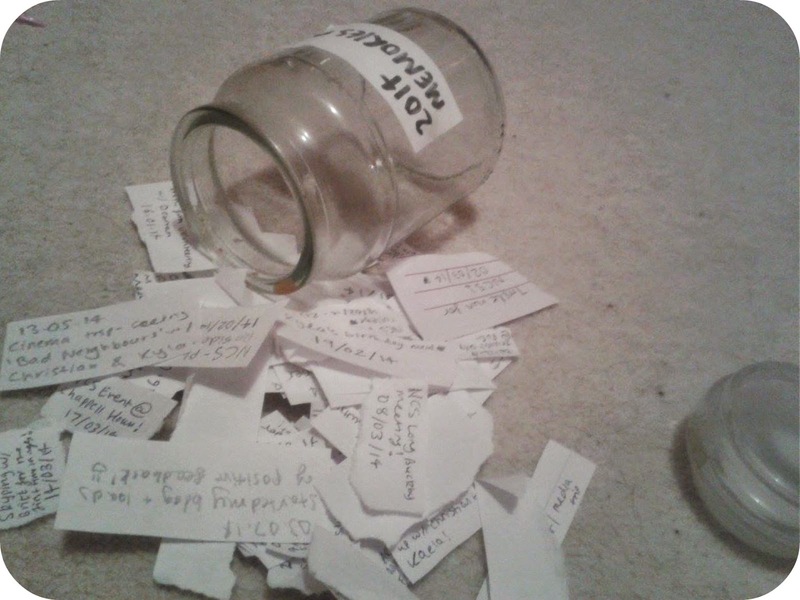 My very first entry into the jar was 'Sam's New Years Party (31.12.13/01.01.14)'. One of my best friends Sam decided to step up and host a new years house party, and to date that was the best new years ever! I remember the soundtrack mostly being Beyonce - her album had only just been dropped on us a few weeks prior! It was so cute when the night ended with everybody there hugging and wishing each other a happy new year. 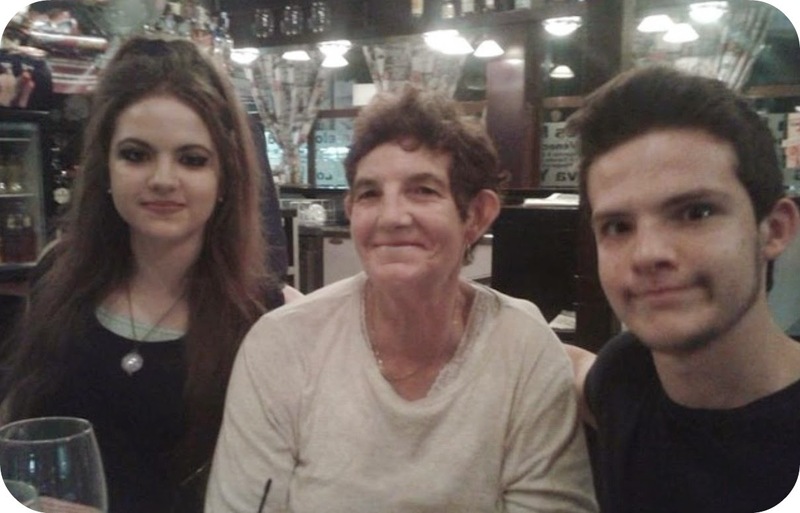 The month of January mainly consisted of family birthdays, what with my mum's 47th on the 16th and great grandma's 92nd on the 24th, both celebrated by lovely meals out I would think! I also see an entry that simply states BUDDIES for January too, which I believe was due to always hating the restaurant but having a turnaround for it this year! I fell in love with the retro decor and music. When you serve mac and cheese and play the Beatles, it was hard to hate it. The only other entries were school related (fun!) - firstly 'Sixth form volunteering with Deborah' which was meant to be a boring old volunteering session, only made fun by then new friend Deborah being fantastic company and thus resulting in a very fun time. Then, it was 'study leave', I must have been SO sick of school by that point that study leave for mocks was practically a godsend. February started off with a really insightful trip with my media class to the British Film Institute. Since our exam prep was all about British film, what better place to visit? Going to London was a brilliant substitute for dull schoolwork, and getting to watch artistic films and learn about the history was really interesting as a media student. The next piece of paper is so cute haha, it simply says 'Reunited with Emma!!' 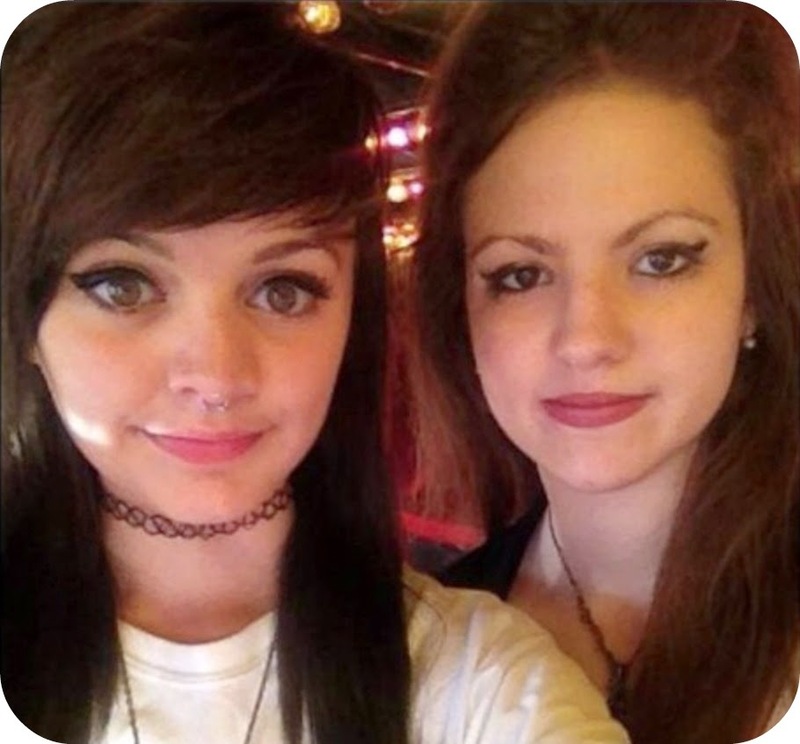 My best friend had decided to swap to college instead of going to sixth form, and this was the first time she came back in to visit us I believe! Ooh the next thing in there was one of the most defining events of my year - NCS! The residential phase came first in Shropshire, and we left on valentines day. The aim of National Citizen Service is to partake in a volunteering programme in the community that you come up with yourself in a team, but firstly you had to spend time bonding with your team. This residential phase was so out of my comfort zone - there were activities such as archery and assault courses but doing activities involving heights such as rock climbing or caving which I was worried about due to claustrophobia really made me push myself and I felt so accomplished afterwards, as well as making tons of new friends in my team. The residential went so quickly it was unreal, and it was soon onto the college phase a few days later, where we'd have to come up with the actual idea. 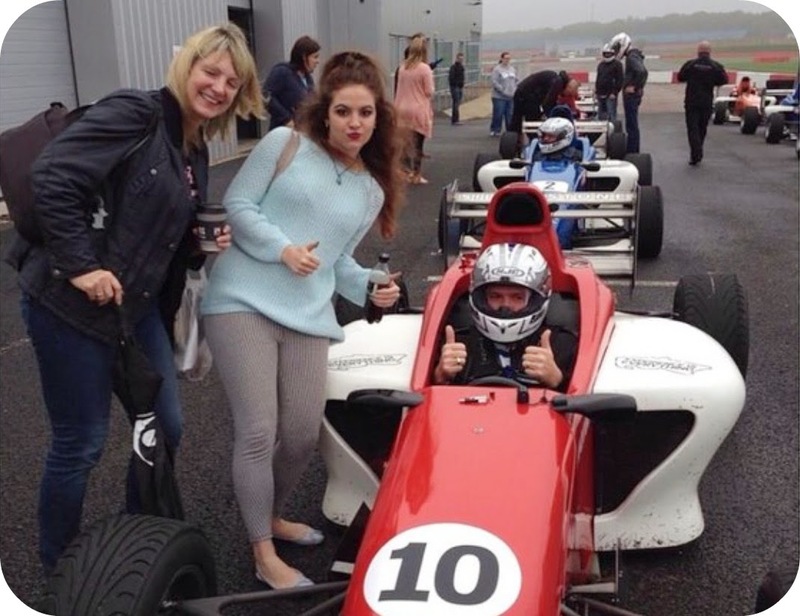 This involved visits from various organisations and more logical team building activities, as well as pitching. It was clear to see that others were more passionate about other things, so our idea was to split into two sub-groups, one would create a video raising awareness for autism, and my sub-group would be helping out in a care home to tackle the issue of isolation with the elderly. Next month would see us make our ideas a reality. After all these NCS events finished this month, one of my best friends Kyla turned 17 and to celebrate this we went to T.G.I Friday's and since I'd only been surrounded by my NCS group for two weeks, it was lovely getting to see my own friendship group again. Second day into the month and it was already back to NCS related activities! We now had to fundraise in order to get our event off the ground, and firstly we decided to do a seven mile run at Pitsford Reservoir to raise some of the cash and also contribute towards the thirty hours of volunteering goal that we'd been set by our NCS team leader. Seven miles later and we were absolutely shattered, but it had of course been worthwhile. The rest of the month would be saturated in more NCS activities but sandwiched in between was a party that I was looking forward to! 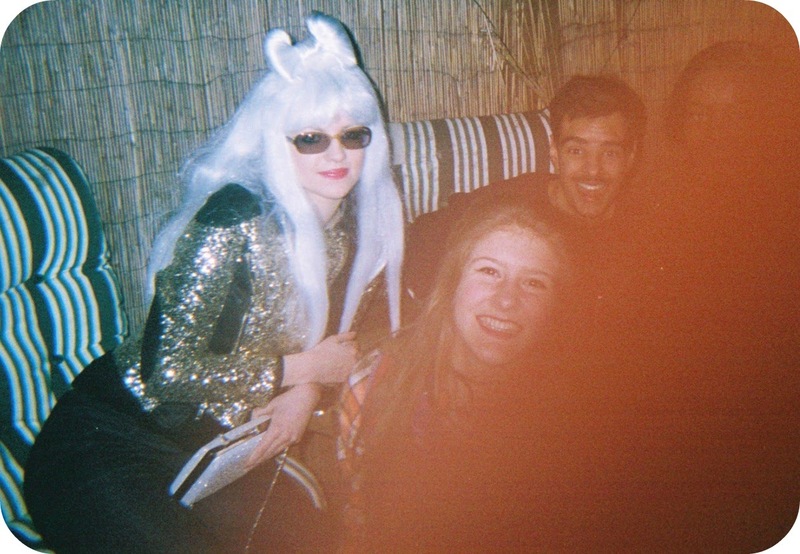 It was another house party BUT the theme was American fancy dress, and this gave me the opportunity to dress up as fame-era Gaga, donning a glittery jacket, shades and a platinum blonde wig complete with bow. It was brilliant seeing everyone in their fancy dress, and rest assured many photos were captured. Following this party there was ALREADY another NCS related event the next day! We decided we needed to meet up as a team, and our team leader suggested Long Buckby fire station, so we all met there and discussed what we needed to do in the run up to our big day. One of the things we had decided is that we had to do a leaflet distribution in Moulton (the area our event would be) and this was fun in itself, especially crossing paths with a classy drunk girl throwing up and trying to insult our team leader...! Aside from that we also did a cake sale, and our event on the 17th came around so quickly! It was at Moulton's Chappell House and we spent the whole day with elderly residents, serving them tea and cake, chatting to them, doing female members' nails, holding a raffle and games of bingo. We all really enjoyed it, and the residents commented that it was the most fun they'd had in ages! We all felt it so rewarding afterwards. 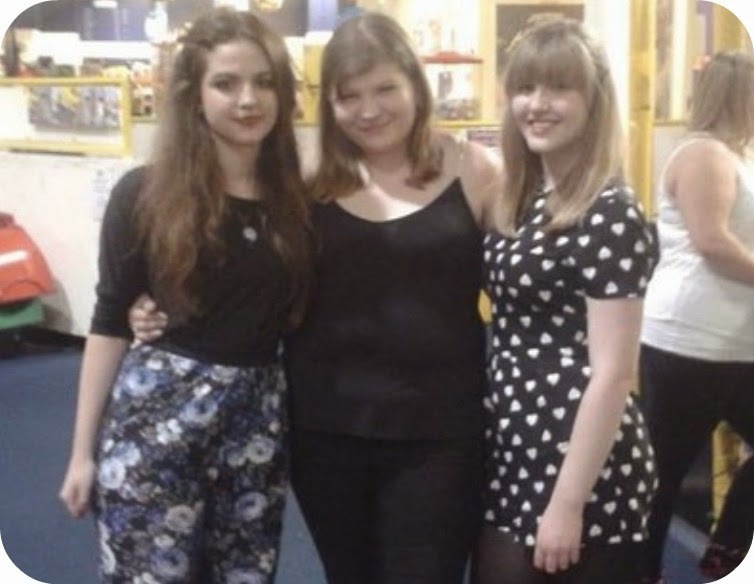 On the 29th it was our NCS graduation! It was all such a whirlwind over the past two months, and we were shown a video put together of all the Northamptonshire groups and our respective journeys. It was brilliant being reunited with my whole team again and receiving certificates signed by David Cameron, all our hard work had paid off and I now had something to put on my Uni personal statement in the coming months. Only downside was that I had to rush off early due to my dad wanting to make a move for the QPR game that day! April seemed to be a lot more chilled, with the memories here being cute days with family or friends. 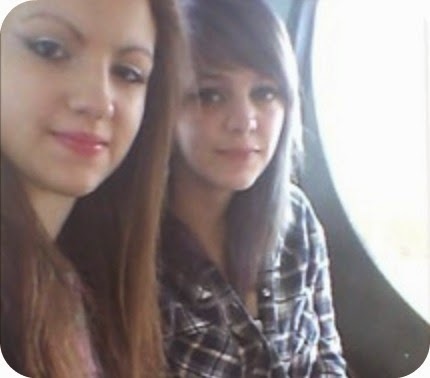 Firstly, there is a 'town trip with Emma' memory, and me and my best friend do love a good town trip, especially as we don't get to see each other all that often. It was a great catch up, and I remember this trip very well, especially purchasing loads of CDs and a Beatles shirt! One of my other best friends Kyla also had such a fun movie night this month, I finally got to see White Chicks plus we had our faves of proper greasy kebabs and also we discovered loads of YouTubers. Meals out seemed to be popular, as I have 'Buddies and the arcades' as well as 'Beefeater' down for April, two top places there with the aforementioned Buddies cropping up again, gosh my family love their food! Oh also, following NCS I felt so inspired that I wanted to partake in volunteering again after the programme ended, so this month I began volunteering at Cynthia Spencer Hospice charity shop, which filled my volunteering void, allowed me to find bargains before anyone else and would be great to put on my CV as it was a shop. May was the month when it was exam central and when I was particularly obsessed with the British YouTubers! Firstly however the memory put in was 'Family BBQ' - so it's clear to see my family get into the summer spirit far too early, that or it reflects how sporadic British weather is. 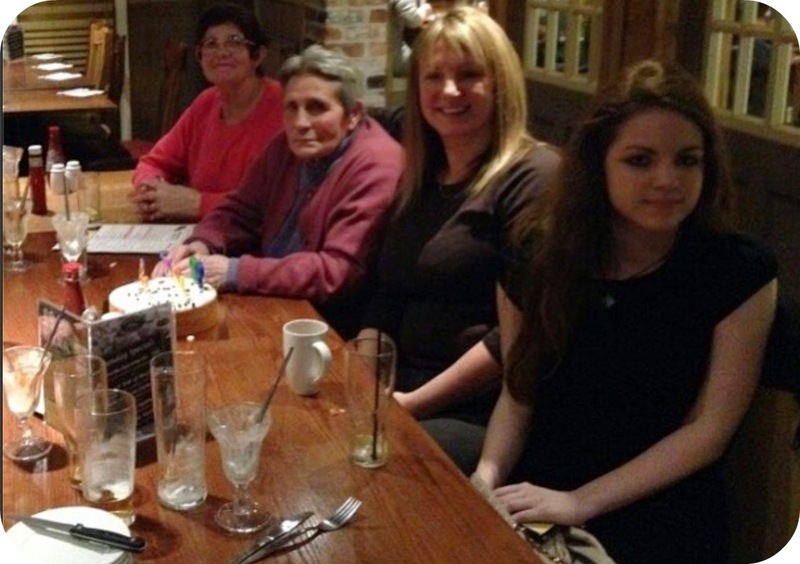 A few days later, it was time for another special family birthday as my grandma turned 75! I believe we celebrated this in the form of a Harvester, which is always fab. Oh gosh, the day after I counted a memory as 'Fab purchase at Shoezone'!! Woooow, this was probably during my 'obsessed with DMs' stage, when I found fake ones that looked nice dead cheap. Okay then the YouTuber thing was definitely evident, as this month both 'Alfie Deyes followed me on twitter!!' and 'Tanya Burr tweeted me!!' both score a memory, but to be honest they were rather exciting at the time! As per usual there are more meal-related memories such as 'Fun Bella Italia/McDonalds trip' as well as more fun trips with friends, such as 'fun catch-up with Emma at the park' where I saw her amazing blue hair in person for the first time, and then 'cinema trip - seeing 'Bad Neighbours' with Christian & Kyla'. I remember this being the day before I had a media exam, oops priorities. It was a rather crude film with some cringe moments, but balanced out with a lot of humorous bits too! Speaking of exams though, on the 23rd there is 'END OF EXAMS!!!' so this was quite the highlight this month, as I had completed my AS Level exams which were hugely stressful at the time! So the month starts off in true me fashion, with the first memory as 'Spontaneous McDonalds trip! ', wow this really highlights how often and how much I love eating out! This is soon followed by 'fun day with Christian' which I believe was us walking around our estate just chatting for hours, those kind of days are so lovely. 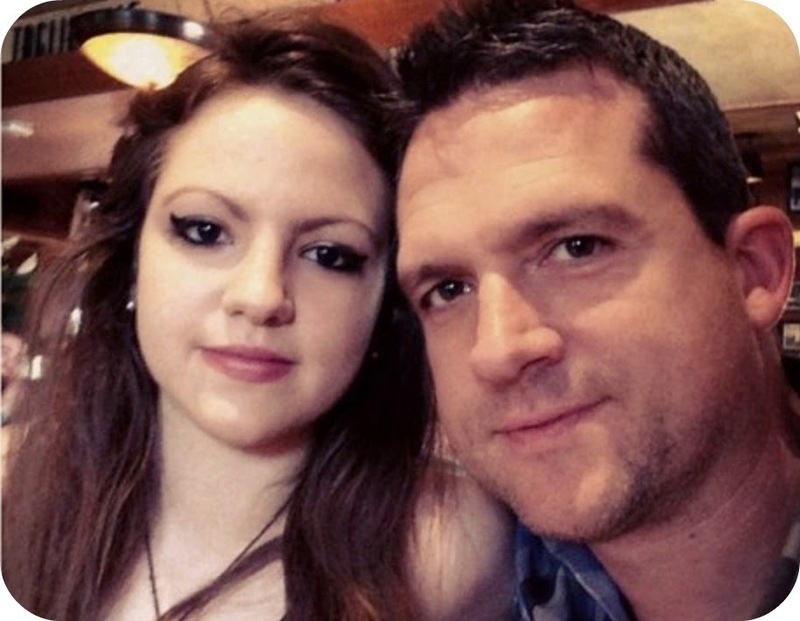 June of course marks father's day and this was celebrated by Frankie & Benny's! Oh dear more examples of meals, but at least there was an excuse this time!! Next up it says 'Uni trip!!' which on paper sounds SO boring but following the Uni trip in question, I left feeling so motivated for my future and it felt so fantastic at the time, like I finally knew that I would enjoy my course and what the future would hold. School-wise, apparently I loved the 'ICT + media day' where we were put in groups and got to make our own trailer and I don't remember enjoying it that much at the time but hey, I must have been on a high from the Uni trip. 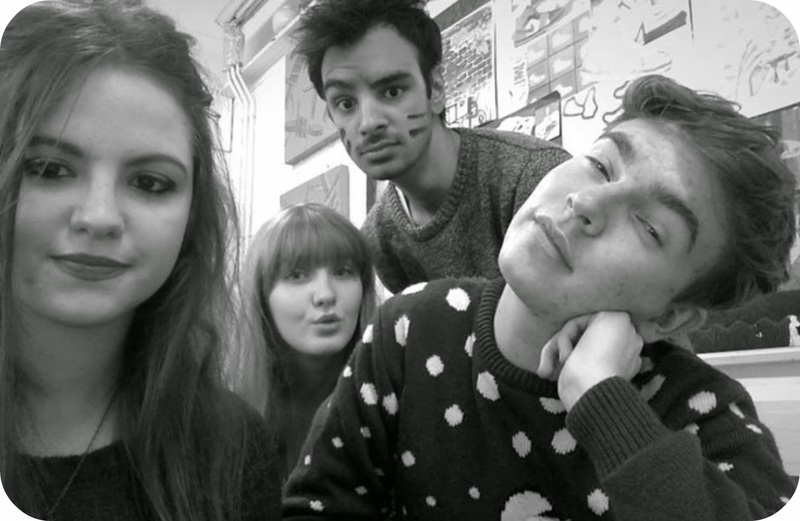 I also apparently had the 'BEST sociology lesson EVER with Sam!!' which leaves me with mixed emotions as in year 13 our classes changed so me and Sam no longer have these epic lessons anymore! Finally, there was 'Going to London to visit family' which was particularly special because a) London and b) because we hardly ever get to visit them (my great nan and her son) so it was wonderful. So July was a fairly packed month! The first day of the month was rather emotional but fun as me and my best friend Emma went to the cinema to see The Fault In Our Stars! Upon this initial viewing I adored the film, but I luckily managed to restrain myself from crying, even if I was dying inside! This was closely followed by the far more productive work experience over the next two days, where I spent my days learning all about what goes on in the media departments at the Argos and Homebase head office. This was so rewarding and fun, and in fact inspired me to create this very blog after one of the girls who I spoke to there was a blogger herself! The memory for the third is SO cute - 'Started my blog and loads of positive feedback!' - thanks to you guys! Two days later was followed by 'First proper Nandos' haha - by proper I mean that I went two years prior but all I ate was garlic bread! So I delved right into their butterfly chicken and was glad that Nandos lived up to how much everyone bigs it up! Later on that day was a local event called Walk In the Park with my friends Christian, Emma and Kyla where you listen to live bands and eat and it was an all night thing, it was such a great catch-up and we all had a brilliant time. Oh my gosh haha, a few days later I had 'Business day with Sam, Hayden & Sam' which also on paper sounds like the most boring thing ever, but I guess I liked it so much at the time because we basically just had a laugh the whole time instead! I also wrote down 'Social Sciences fair' oh gosh haha, me and my friend Christian had a laugh though all day, and it was when my friends were obsessed with the Kim Kardashian app! Lastly, there was a festival that my school hosted with acts currently there or alumni performing for us, and it was surprising just how talented people were! Ooh the best moment came on the 18th, the 'SUMMER HOLS!!'. Need I even explain? Next up was supporting my brother in his futsal tournament! It was actually quite fun, and amusing to see how much the boys in one of the other teams kept showing off! Apparently an all-nighter with my brother was also worth a mention too. A couple more family days followed, what with 'YUM curry at the Grange Inn' and 'Fun in Kettering - the wimpy and bowling!' being written down. As I said before, we do love our meals out my family! Especially with bowling chucked into the equation. August and December are by far my favourite months of the year, so of course I was so excited for it to arrive! There are so many bits of paper for this month, starting with 'pizza hut trip!!' on the first, once again, oh dear! Pizza hut buffet is lush though, to be fair. However, a mere three days later was my birthday! Yep, I turned 17 on the 4th of August, and my birthday was made so special going to the Brittania and followed by a Mandarin meal. Three days after that was my brother's 16th, where we saw the hilarious Inbetweeners 2 in the cinema! 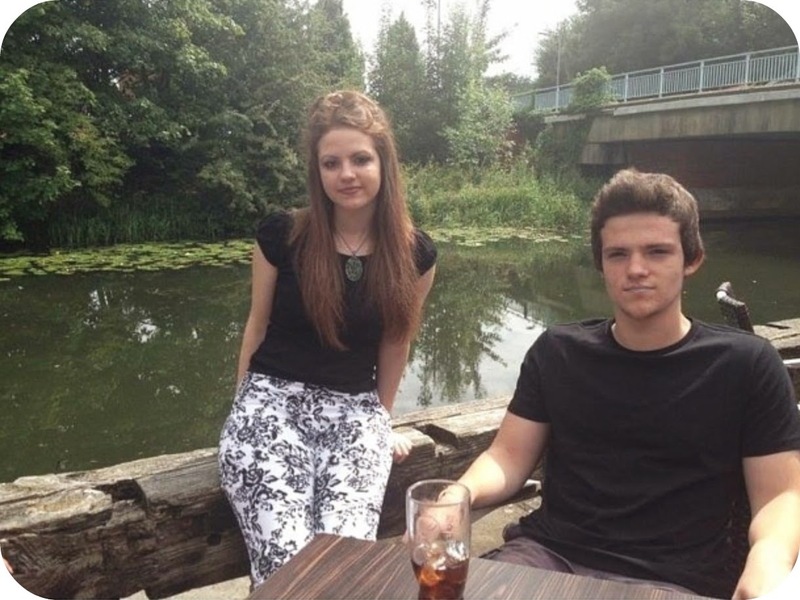 Birthdays are usually the foundation of August, what with my cousin Sophie turning 21 also this month! Away from the birthday fun, the following week I would be getting my AS Level results so that was in the back of my mind. The day prior, me and my friends Christian, Emma, Kyla, Sam, Kieran and Kaela all had a fun day out once again at pizza hut but with the arcades too! So that was pre-exam fun, and now the next day was met with stress for us year 12s (and of course anyone else receiving their results at the time). Anyway annoyingly the school website had an error with our results and we didn't get them for hours. However, I finally did and I was THRILLED to to get A B B D! I honestly thought I'd tanked, so it was such a relief to have not only passed them all, but be completely content. Knowing my family, the first thing we did was of course a celebratory meal! The following day was also a bit of a celebration too, as I met up with Emma in town to have a huge chat, and after getting the bus home I actually spotted Christian and Kaela too! Aw. Of course with it being exam season, my brother also received his GCSE results a week later! He got a fantastic set of grades and once again it was... a meal out!! Oh, the suspense. So yes a lot of happy times in August, rounded off by... the ice bucket challenge of course! God knows WHY I put this in there, but it was back to school on the 3rd for my first day of year 13. I guess we must have been eased in gently! It was back at school working hard, including analysing the Fault In Our Stars in media, so how fitting that I went to go and see the film again in the cinema a couple of days later! I wasn't as impressed the second time round as now I knew what happened, I began picking faults in it. Oh well, something far more enjoyable was a couple of days later. It was my dad's 40th on the 15th of September so a couple of days prior, we all went to my hometown Watford and spent a huge family day there having a barbecue and everything. My dad also received a thrill drive as a present, so at the end of the month we had quite the lads day out, with my dad doing his thrill drive at Silverstone, followed by the QPR match in the same day! Finally, blogging-wise I wrote down 'Sent free stuff for blogging!!' so yes that was unashamedly the first time I had been sent something by a PR company, which felt so rewarding in terms of progress at the time. Ah, this month was rather bleak. There is just the one memory here, as due to the passing of my great grandad, there was a looming cloud of sadness that was hard to escape from. Still, at least the good memory was such a mega one! Instead of our annual holiday in the summer, we instead decided to go down the cheaper route of going on holiday in October! We went to Spain for around eight days and it was exactly what we all needed! We got up to so much, such as getting to go to the beach in Autumn, exploring the sights, eating out and shopping amongst other things. Definitely the worst month of the year on the whole, but Spain was definitely a huge highlight of the year. So thankfully this month was definitely looking up! It was brilliant on both a personal and social level. Prior to this year I had never really done anything to celebrate bonfire night, but this year I got to go to two firework displays! The first was with a huge group of friends followed by a McDonalds and Starbucks, then that same weekend I went to one in my estate with my two best friends. Both nights were so much fun, although the playlists while the fireworks were going off were rather awful, with the inclusions of hits such as 'Firework', 'Relight My Fire' and 'Firestarter'...! I was already on a high, but then the following week did absolute wonders on a personal level as I FINALLY got a job after a lot of unsuccessful interview processes! Better yet, it was somewhere I had wanted to work ever since I was small! On 15th November I started my current job at HMV and it's been such a brilliant experience, as well as having excellent colleagues to make the shifts more enjoyable. Yay! As I said before, this month was decidedly quite social. I had two unconventional 18th parties in just over the space of a week, instead of the usual clubbing, firstly Lauren's 18th was a huge gathering at pizza hut, and then Chrissie's turned the whole idea of an 18th on it's head as she had it at a place called Kids Play! Basically one of those huge indoor activity centres for kids, but as a laugh she invited about fifty people and we all had a brilliant time, but it was so exhausting, particularly the trampolines! The month ended on a high, with one of my best friends Sam having a pizza night at his house, with a whole group of us having loads of Domino's pizzas with Christmas music and gossiping - fun fun fun! Oh good old festive December, I miss you already. Of course I spent the entire month capturing the run up Christmas through Blogmas! However, there were a few certain days I did write down. Firstly, Christmas jumper day! Yes I am a sad person who got excited at the thought of wearing my Christmas jumper! However, it wasn't just that, the day on the whole was so cute with my friends. Around a week later, the Christmas holidays arrived and I was delighted to finally be getting some well deserved lie-ins after being at school every week day and then working all weekend! Of course lets not forget CHRISTMAS itself! What an incredible day as it always is, sharing the magic with my closest ones. Boxing day was also good too, as we went down to the pub and it was karaoke night, always a guaranteed laugh! The year was toasted off spectacularly last night as a family, with a huge match of trivial pursuit and a kebab! Not the best idea at work today, but luckily I managed to recover from the kebab and lack of sleep! I really hope you guys enjoyed reading and visually absorbing what my 2014 was like. It's been up and down but definitely the best year of my life on a personal level! Apologies for how long this turned out to be! You did the ice bucket challenge too? When we did it it was SO COLD OUT and the water was freezing!! haha. Also your hair is just lovely and love your outfits too! Nice recap . Hope 2015 will also be a great and fun filled year for you. Hehe thank you, I'm glad you enjoyed it! Wow it amazes me that people actually read all my rambling, it means so much though! I really did, and I hope so too! Thank you so so much, I hope you girls have a brilliant year! I saw so many people did this! It's such a cute idea and I wish I had done it earlier! So this year I decided I wold do one :) I've left the link below if you're interested!